And, run around Mount Sinai. Antichrist-- Like this neo-Pharisaical cult. The authors of the following articles have been threatened with litigation, attempts at FBI baiting, virus attacks, and Hate Crimes investigations. WHY BUY A FECES PADDLE? or be damned to hell. and tell us in case we miss the PayPal notification. In your email be sure to give us your address. There is a cultic phenomena taking place and growing rapidly. This is the Yahweh Movement, of what has been called the Hebrew Roots Movement. It is promoted by sub-christian gurus who are completely loonie on one extreme, while men like Marv Rosenthal promote the thing on the more rational side by promoting Zionism and Israeli statism in the Lord's Church. As in all cults, degrees of heresy exist, so all parties in this cult will claim they are different than the others and beg to be declared Kosher. Being a pork chop lover, I would not be the best one to declare anyone Kosher. The anti Jewish mind set is defiantly satanic and is the same mind set that killed over 6 million Jews in the holocaust and is also responsible directly and indirectly for all of WW II deaths. When the rapture takes place and all that is left is this kind of anti Jewish conspiratorial thinking, it will be a mad house. Beware of Texe Marrs and other hate mongers like Hendrie who are blaming Jews for every problem on earth. I have recently been attacked viciously by a man who is full of the most evil hate for Jews, and he claims to be doing this in the name of the Carpenter of Nazareth. I am also hearing of this trend growing in Fundamental churches. Do not let these people fill you with their lies. For the record, hate should only be reserved for sin in you and me, and for the enemies of God. Worldly Jews are no more the enemy of God than anyone else who is unsaved. If your pastor attacks Jews, confront him openly, and try to get him run out of your assembly. The way many men cover their hate is by distinguishing Zionists from real Jews, that is, in that Zionists have a Satanic religion. There is a kernel of truth in that logic, but if these preachers end up just blaming Jews in general for all the evils in the world, they are demon possessed. But, there is another problem-- That is, the cult in the Lord's Church which is trying to make Jews out of Gentile Christians. It is madness. I want to make it very clear that this page is NOT about bashing Jews. Those Jews who accept Christ as their Savior, WITHOUT adding cultic trappings, are received into the promises of the Church like anyone else. The problem is, a whole discipline of fiction has been wafted in over the Lord's Church by converted Jews at prophecy conferences and by cultic "Jesus Made me Kosher" types who claim a special place in the Lord's Church because of their Hebrew heritage. This is heresy. Some alleged saints, who figure this cult out, later move on to hate Jews. How utterly stupid. Nor will we allow any jerk water latter day scholar to accuse us of not loving the Jewish people. This is a neat ploy used by degraded Judeo-Gentile apologists who realize they are on quick sand theologically. They attack the true believer who sees and exposes their Mother Goose doctrines. To them we say, "Repent, or you too shall perish." We are not hearing from 95% of the Fundamental Baptists on this topic. Fundamental pastors are too busy hyping their bus ministry and shearing the sheep as frequently as possible. The Bible Church movement is inebriated by the prophecy conference speakers like Marv Rosenthal, and they don't notice this heresy-- "Just tell me when the next Passover demonstration is." The Pentecostal and Charismatic Movement eat this heresy up. Why? Like tongues et al, this heresy feels good. Play games with God's Name and the precious Name of Jesus Christ. It gives the local church a new and trendy hype to keep the groupies happy. "Blow the shofar," says the guru. These people keep the feasts, keep the Passover, and make a mongrel cross between Law and Grace. But, they are very inconsistent. They don't kill the Passover, and they don't kill the daily sacrifice. I like to ask them where their feces paddle is. I have yet to find a Hebrew Roots junky who carries a feces paddle as Moses commanded the Jews. Read the following carefully. Are you one of those who has made a cult of Jewishness in the Lord's Church? but it now has become clear that it is not outdated after all. lead to it by Ellen G. White. narrow way who reject this Zionist Plot Supremo. all sorts of Hebrew Babylonian names and titles. Paganism infiltrates Zion and the Church- Large study. Get your own shofar andchase devils around the mountain. believe this and think they are blood line descendants of Jesus Christ. It is very gratifying to have the right sort of enemies. Jesus had his, Paul had his, and we pray that these are the right ones of ours that our Lord would approve of. WHEN ANGLO SAXONS TRY TO PLAY JEW-- It would be really funny if it were not so insane. VERY CONVICING-- And, deadly. I truly believe that one of these Hebrew Roots gurus could be the Antichrist. The above site exalts the following "ministries"
Koestler ate psychoaltering mushrooms with Timothy Leary for kicks. What an impeccable source for an alleged Christians gang in attack Jews. WHITE SUPREMACIST JEW HATRED IN A THIN CANDY SHELL OF CHRISTIAN ZEAL: You will have to register to enter. Enter at your own risk. This site has to be watched by the NSA. This site is 100% ecumenical with Roman Catholic site included. Ask a Christian Rabbi (honest :-) questions by E-Mail. Note the European look, NOT Semitic at all. Really folks, this theological nut case teaches just that. END TIME SERVANTS AND HANDMAIDENS- This cult has been around since about 1980. 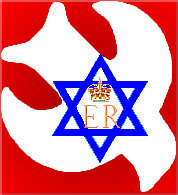 It is Hebrew Roots in heritage and highly cultic and exclusive. If a reader would order this and send it to us, we would be grateful. This illustrates the seductive draw that Hebrew Roots has on alleged Christians. This is the "dung" the Apostle Paul left behind. HaY'Did Learning Center Lots of free materials to print off! Jerusalem School of Synoptic Research ~ A mob of Jewish and Christian scholars who are examining the synoptic gospels (Matthew, Mark and Luke) within the context of the language, land and culture in which Jesus lived.